Obviously I'm running this through my ignorant, modern-Western paradigm of beauty, but it's something I noticed a while ago. Gay men are generally in better shape than their heterosexual counterparts of the same age. Is it because men are inherently judgmental of their partners' physique and when you take 2 men together, that judgment becomes even more apparent and pronounced? They also seem to have really good skin, but I think that can be chalked up to their fabulous spa/resort-frequenting lifestyle and all those bathhouses, which leave their pores squeaky clean. And even when they're not in the best shape or have superior skin, something about the homosexual face structure produces more gay '10s' than straight '10s.' What's up with that?! It can't be helped we were just born that way ;) haha. Thanks though what a lovely compliment! 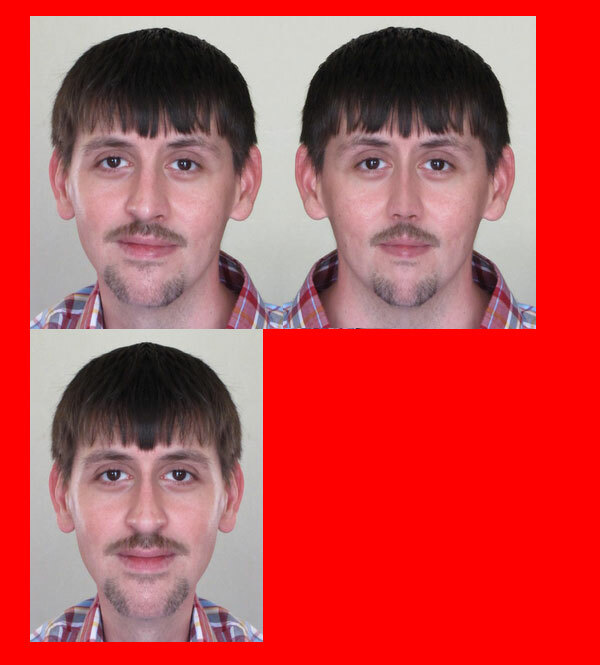 Lol, I just found myself on Google searching for "Gay face" so I could photoshop more symmetry in and compare. This is trolling at its finest, indeed. Regardless, I found the results interesting. There is a slight correlation with an asymmetrical facial bone structure. http://i.imgur.com/0AFKQ7j.jpg ...clear cache, haha. Someone should make a Gaydar app with facial recognition. I think this is actually interesting stuff. Gay men get intense aerobic exercise on a daily basis, oftentimes multiples a day. A larger percentage also hit the weight rooms, it seems. They have excellent blood flow as a result. At least until they get AIDS or some other venereal disease, and become bombed-out shells in their late 40s and thereafter. like being really really rich and popular. I think this is trolling at its finest. The gay community keeps the uglies and fatties in the closet. There's a lot of discrimination in gay circles based on appearance and a very narrow definition of beauty. You either need to be a an A&F type or a bear type - anything in between is just weird and undesirable - despite most people being average looking (hence the term, average looking). Disclaimer: I'm totally down with gay men (and women). I have a gay brother, many gay friends and work in a field with lots of homosexuality. Love is love! At first I was going to discredit this question as non-paleo and pretty off topic (why the bone / bones tags, haha.) But, now you've got me thinking -- can gay men acquire feminine features from having different hormones at birth, or do those hormones (potentially higher levels of circulating androgens) maybe drive you toward a more feminine look through behavior / hygeine as excess androgens could create skin issues which you would then want to solve, or is it maybe that it's some cultural thing, where there's a certain "look" you would want to fit in, which includes above-average skin care. I don't know. im feeling this is just an observer bais... ie you simply assume all the fat and bald guys you see are straight, the only ones you notice are the ones who are in shape/stylish/frilly(obviously gay) - a look which you desire. feeling this is almost a form of positive racism ... 'all those gays go to spas frequently and stay in shape/dress well.'. im pretty sure i saw a statistic online that something like 75% of lesbians are obese.... although im sure many men are under the assumption lesbians are hot. and beyond that how could you even come up with statistics on something like that, or on something so relatively subjective.